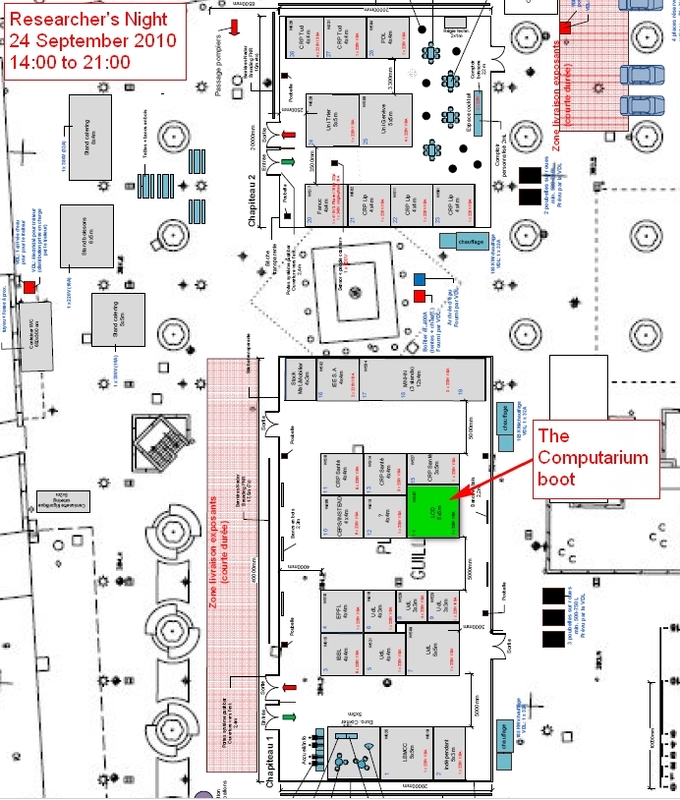 Here is a list of exhibitions and miscellaneous activities organized by the Computarium crew. Click here for the "Tools and Docs for Workshop leaders"
09 May 2018 LCD Science Deeg 2018 with two Computarium workshops (Chinese ABACUS calculus and Retrogame_IQ = vintage Sokoban). 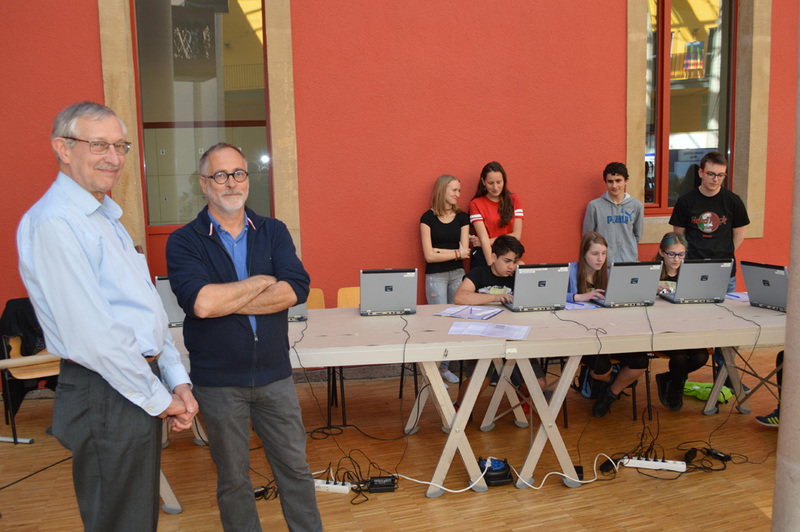 Our members Claude du Fays, Jean-Claude Krack and Marc Lavina supervised the two workshops which were held by the 9 students of the IIIB (a specialized math. section). The picture (by Frank Schreiner) shows Claude and Jean-Claude in front of the Sokoban workshop. 10 May 2017 LCD Science Deeg 2017 with two Computarium workshops (LOGO programming and Chinese ABACUS calculus). About 100 children participated to our workshops (which were two of many others, all Science based). See album (photos by Francis Massen, Claude du Fays and Frank Schreiner). 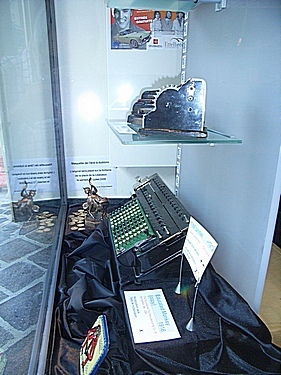 17 July 2016 Branebuurger Maart: Claude Boes, Colette Heirendt and Francis Massen installed a small workshop on "Calculations without electricity": Arabian multiplication, Napier bones and Genaille-Lucas rulers, abacus, sliding rod calculators and a couple of rotary machines were used. 21&22 May 16 "Invitation aux Musées" weekend. Claude Boes, Claude du Fays, Ronny Heinz, Colette Heirendt, Florence Massen, , Francis Massen and Anoul Neven managed this weekend. Workshops covered Napier bones, Genaille-Lucas rulers, abacus, Logo on vintage BBC Masters. For fun there were some vintage games running on emulators and several original Pong's. 11 May 16 The LCD Science Déeg had an attendance of about 200 pupils from neighboring primary schools. See album. 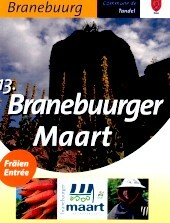 19 July 2015 For the third time (after 2001 and 2012) the Computarium participated to the Branebuurger Maart, of which our member Claude du Fays is one of the principal organizers. 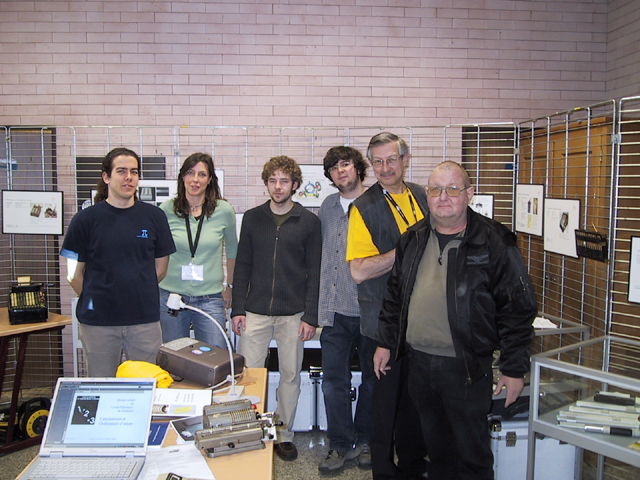 Colette Heirendt, Claude Baumann and Francis Massen demonstrated during the full day sliding rod calculators, Brunsviga machines, slide rules and abaci. The visitors were shown how to use these machines and often spent quite a lot of time. For the first time we also had a quickly made medieval-type calculating mat, used with nuts instead of pellets or stones (visitors were given a free bag of nuts). The mat at the right shows the number of visitors, and a short album gives more pictures. 16-17 May 2015 Weekend IAM ("Invitation aux Musées") the 16/17 May 2015. The Computarium joined this country-wide organisation meant to promote the Luxembourg Museums, and which involved all museums of Luxembourg. 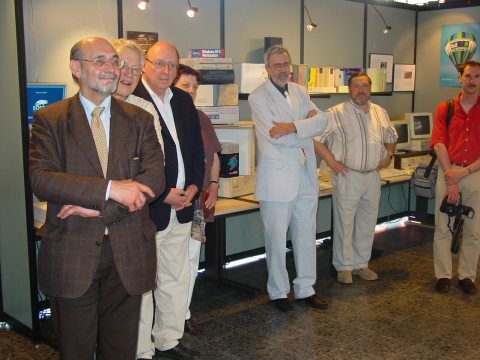 Among the 6 museums in Diekirch, the Computarium was second for the number of visitors. See album. 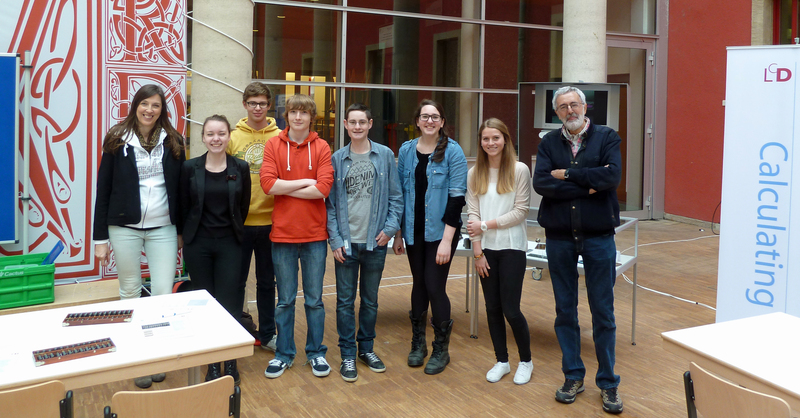 06 May 2015 LCD Science Days had again 2 workshops organized by the Computarium crew. 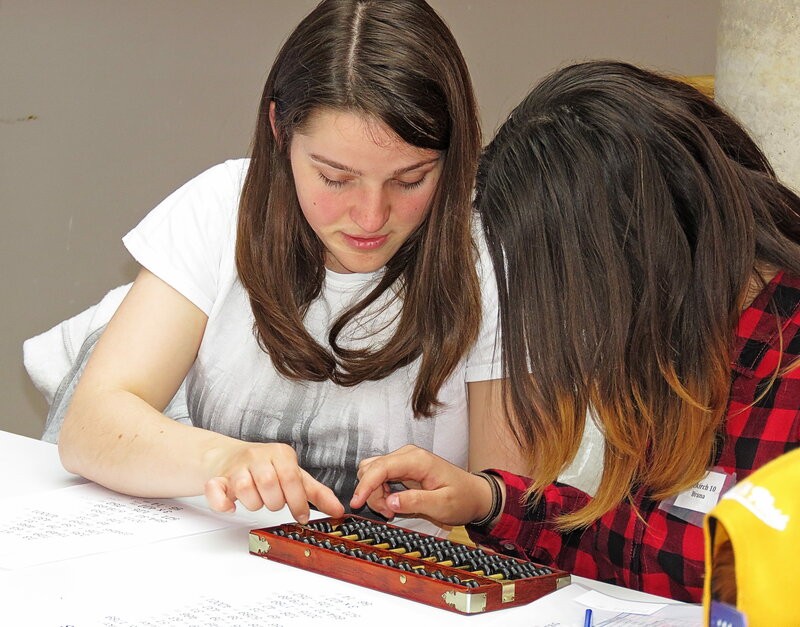 Geneviève Harles supervised a workshop on Brunsviga mechanical calculators, and the Claude du Fays crew brought the 11-12 years old children to grasp the fundamentals of calculating with a chinese abacus. As always, older students from the LCD held these workshops. See album and 3 small videos here, here and here. All pictures and videos by C. du Fays. 28-Apr-2014 The Computarium participated with 2 workshops (Logo and Abacus) to the 2014 edition of the LCD Science Days. 6 students from the mathematics section II B introduced 11-12 year old children from primary schools to notions of Abacus calculation and Logo Turtle Graphics programming. 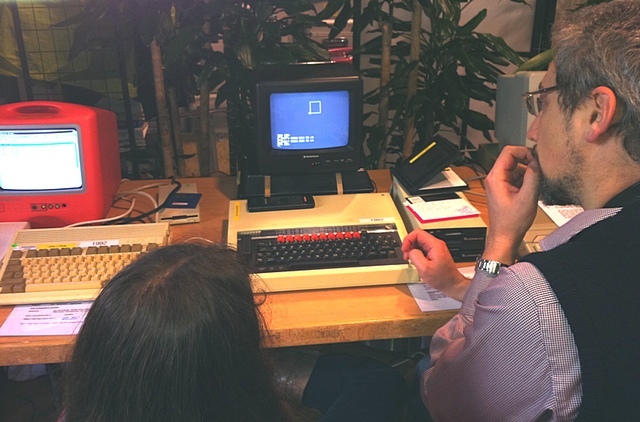 The Logo programming was made on vintage BBC Master computers from 1987. 03-Apr-2014 Afternoon workshop for a group of 10 children from the Luxembourg section of MENSA. 13-Jun-2013 Workshop for the IIIe B students of the mathematical section of the LCD (prof. Geneviève Harles). These 17 to 18 years old students were divided into 2 groups of approx. 11, and each group had a short guided tour. The major part of the workshop were hands-on exercises with pin-wheel calculating machines (mostly Brunsviga RK13). We covered the 4 operations and even Toeppler's method for calculating the square-root. Click here for a second picture. 08-Jun-2013 Workshop for the Maison Relais Tandel. 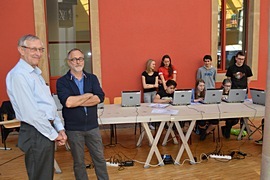 A group of five K10-K12 children from the "maison relais", together with their coach Vanessa HANCK spent two hours in the Computarium. They learned how to use a sliding rod and a pin-wheel calculator and finished off by playing some vintage games on historic equipment.. 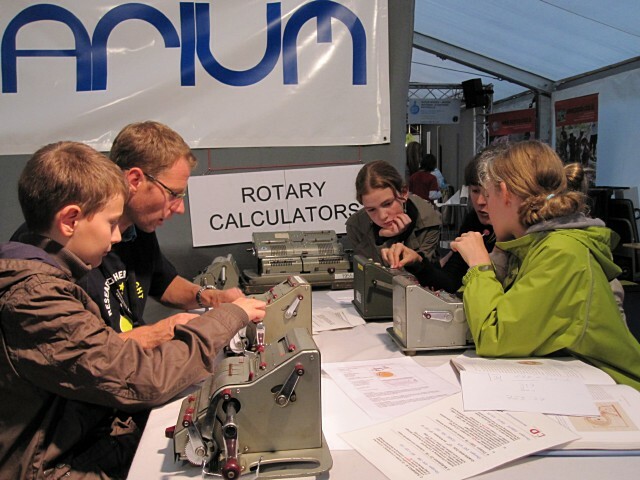 The Computarium joined this yearly science day with two workshops on abacus and sliding rod calculation. The approx. 20 different workshops are given by LCD students to about 200 K11 children (in their last year of primary school). Two groups of students of the mathematical section (class III B) did their "Computarium" job admirably well, after an afternoon training and briefing session by C. du Fays, G. Harles and F. Massen. 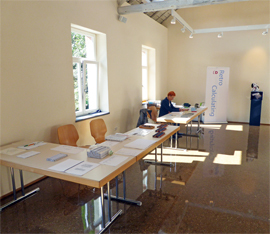 The Computarium participated to this regional event for the second time. We had an exhibition of working vintage video games (Pong, Atari2600 and Philips Videopac G7000) and 6 laptops running games in emulations of old personal computers. Jean-Claude Krack helped making the transportation to Branebuurg and mounting the exhibition. Next day Pol Eyschen, Geneviève Harles, Colette Heirendt, Liz Hertz, Marcel Kramer, Jerry Lambert, Francis Massen and Luc Ohles did the workshops and helped dismounting all the stuff. The Computarium participated this year with 2 workshops to this big organization, where over 200 children from K11 classes of Ettelbruck, Diekirch and some close-by primary schools spent either the morning or the afternoon in the large hall of the LCD. 20 workshops were held by the LCD students. The first Computarium workshop was about historic games running on emulations of vintage computers; the 2nd one was about games running on real live historic hardware: a Superelectron PONG, two Atari 2600 and one Philips G7000 (all machines from 1997-78). Liz HERTZ, Patrick HOLSTEIN, Kim Lin NGUYEN and Jerry LAMBERT managed the workshops. 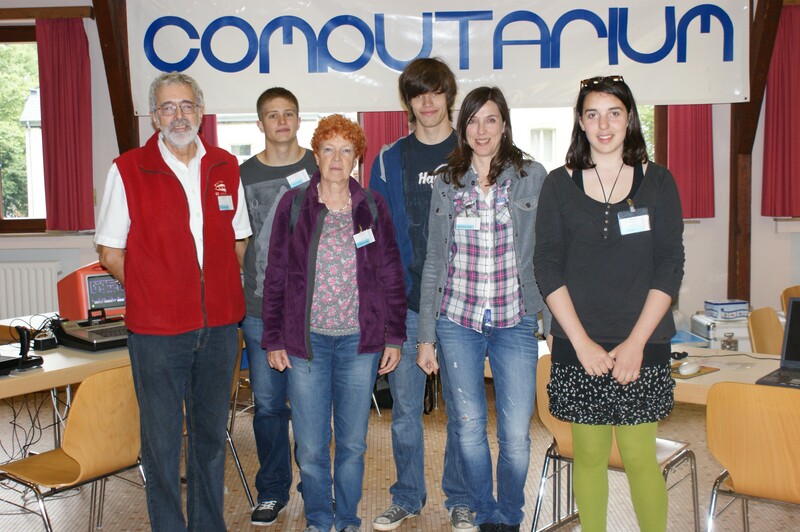 Geneviève Harles, Jean-Claude Krack, Marcel Kramer and Francis Massen from the Computarium crew helped out. 25-Nov-2011 Pol Eyschen (IIIe B2) and Liz Hertz (IIe B2) held the "RetroComputing" workshop prepared for the Science Festival once again, this time at the Computarium at the LCD, for 10 students and 3 teachers from Kijimadaira Junior High School (Nagano prefecture, Japan). Our Japanese guests have not only enjoyed the workshop itself, but have also been impressed by the large exhibition of computers at the Computarium and have, above all, greatly appreciated the excellent performance of Pol and Liz. 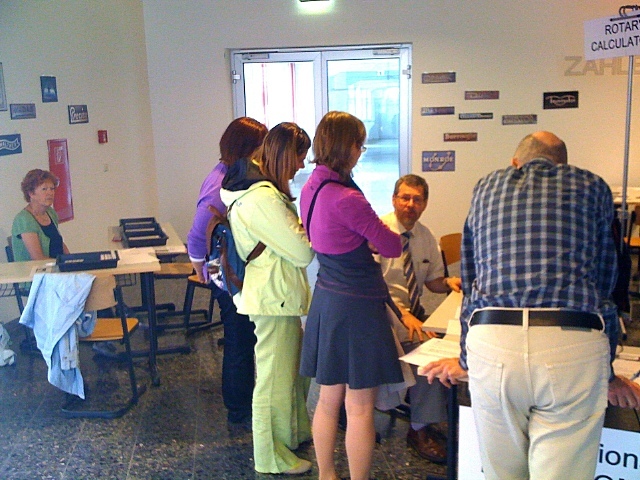 10-13 Nov 2011 Science Festival in Luxembourg, Musée National d'Histoire Naturelle and Abbaye Neumünster. It was heavy work, paid off by a big attendance: about 120 pupils during the first 2 days with 10 workshops, and about 500 visitors during the last 2 days open for the general public. 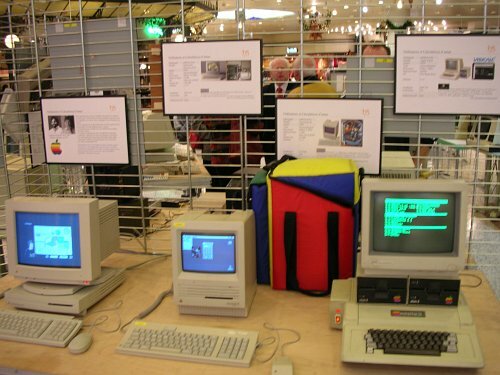 The emulated games as well as the real vintage machines gathered large crowds, and the enthusiasm of the parents and elders was not smaller than that of the younger!. 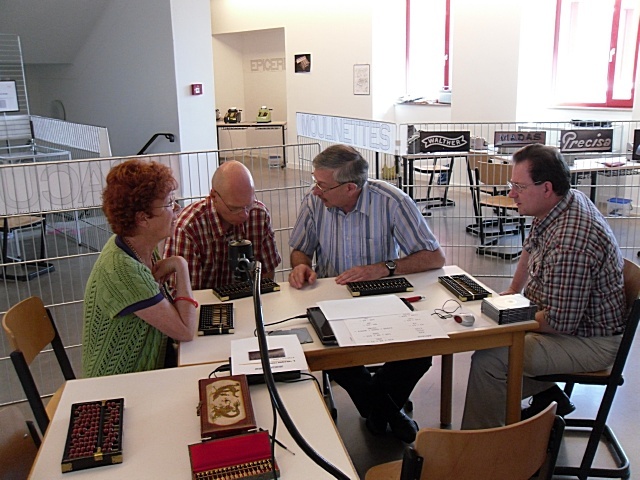 The Computarium participated to this cultural event (main organizer is our member Claude du Fays) with a small workshop/exhibition of mechanical devices (sliding rod calculators, pin wheel machines, printing adders) "Gerechens duerch d'Zäit" (Calculating through times). It was quite a success, with close to 140 visitors. Liz Hertz and Kim Lien Nguyen from the 2e B of the LCD and C. Heirendt, C. Baumann and F. Massen from the Computarium crew managed the event. 04 May 2011 LCD Science Deeg at the Lycée Classique de Diekirch. The Computarium participated with 3 workshops (rotary and sliding rod calculators, chinese abacus) to this Science Fair organized for the children of the last year of primary school (K12). What was special at this happening was that our 10 LCD students were on their own to manage the workshops, what they did with great enthusiasm and skill. Schamer Vic, Raposo Gil, Miller Anne, Dupont Betty, Lambert Gerry, Eyschen Pol, Holstein Patrick, Nguyen Thi, Herz Liz, Oly France, Dassesse Kate. Researcher's Night at Luxembourg City. The Computarium had a booth with 4 workshops during the Researcher's Night organized by the FNR (Fonds National de la Recherche) in Luxembourg City. On the prestigious Knuedler place a vast area hold 2 large tents with a lot of boots. Most were occupied by members or departments of the University of Luxembourg or foreign universities, the CRP's (Public Research Centers) or some private companies. We were the only secondary school among these folks. Our team of 10 had a big success, with an estimated 250 visitors for one or several of the workshops running under the title "Calculs Zéro Ampère" (translation: "calculating without electricity"): Abacus, Napier Bones, Sliding Rod Calculators and Rotary Calculators. Pol EYSCHEN, Geneviève HARLES, Colette HEIRENDT, Marcel KRAMER, Francis MASSEN, Marc LAVINA. (Traditional helpers Ronny HEINZ and Florence MASSEN are not on this group picture). More pictures in this album! 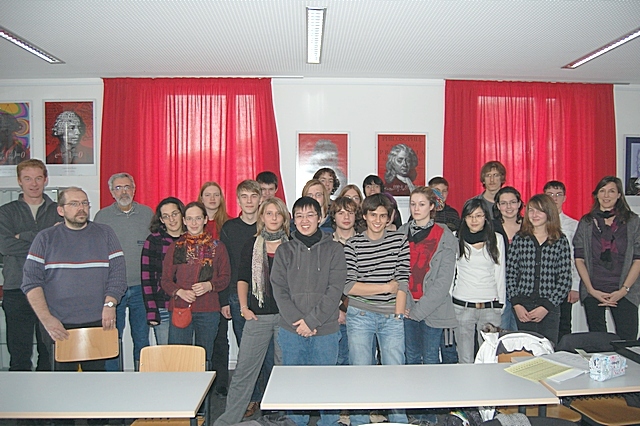 More than 200 former students of the Lycée classique de Diekirch met at the LCD. The Computarium organized three mini-workshops (Napier Bones, rotary machines and sliding rod calculators) and commented guide tours. VINTAGE DAYS organized by the town of Diekirch. 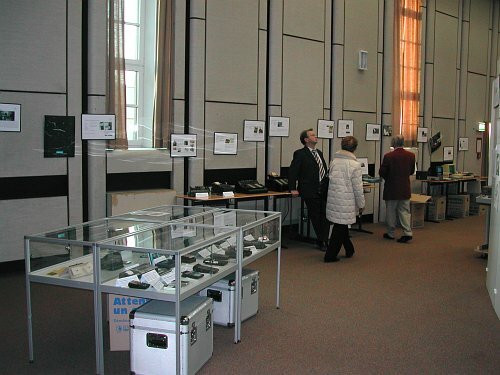 The Computarium showed its exhibition and held 6 workshops in the LCD: Napier Bones, printing adders, elctromechanical and rotary calculators, slide rules, abacus and sliding rod calculators. See album! 02 Feb 2010 Workshop TALENTA at the LCD, dept. of mathematics. A group of 21 students from all ages participated in a workshop on slide rules (presented by Marc Lavina) and Napier Bones (presented by Geneviève Harles and Francis Massen). The workshop closed with a competition at various difficulty levels, involving calculations to be done with the slide-rule and the Napier bones. 16 May 2009 Workshop at Hall 1 of Luxinnovation and for the European Year of Creativity and Innovation. We were a crew of 9 persons (6 from Computarium: Baumann C., du Fays C., Krack J-Cl., Lanners C., Heirendt C., Massen F.), 2 former students of the LCD (Neven A., Meyer J.) and one actual student of the LCD (Ohles L.). Contrary to our uneasy expectations, this was rather a good success: we had many visitors from 10:30 to 18:30, among them many VIP's (like minister François Biltgen and M. Raymond Bausch, secretary general of the FNR). The "Abacus department" of Claude du Fays was running without interruption, and the Napier Bones and Sliding Rod Calculators also had many interested visitors. Most visitors stayed quite a lot of time, which is very unusual for a cultural event embedded in a consumer exhibition. Jun 14-Jul 04,2008 Pico-Expo in two windows of the Syndicat d'Initiative de Diekirch. 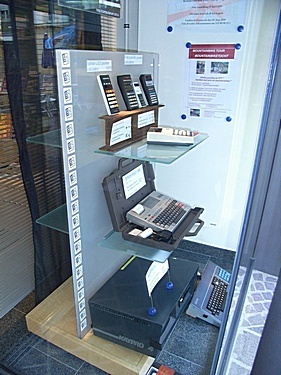 Left window holds some mechanical devices (including the beautiful Tim Unitas at the bottom), right portables (Kaypro4 and Epson HX20) and some pocket calculators (HP35, TI59, Sinclair Cambridge Scientific etc.). The Cirque des Sciences was a very big organisation held for the event "Luxembourg, cultural capital of Europe, 2007" at the breathtaking Neumünster site in Luxembourg. Our workshop (there were many others) showed old calculating devices, from Napier bones, slide rules, abaci, sliding and printing adders to rotary calculators and heavy electromechanical machinery. Preliminary album ( Photos F. Massen) and definitive album (photos J. Mootz). A slide show with pictures of all the other workshops can be found here. 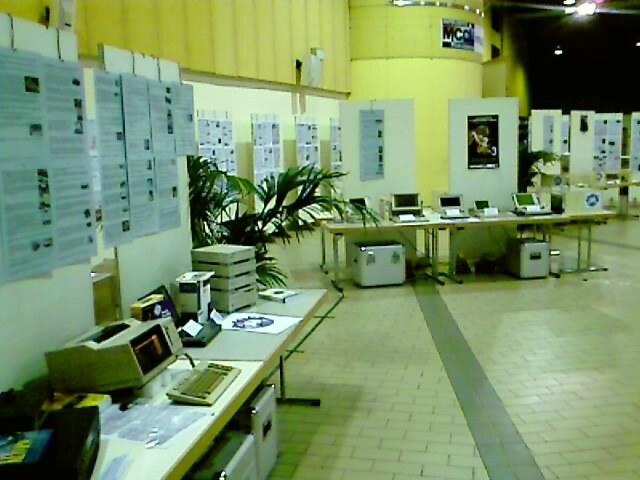 Exhibition of vintage personal computers, held in Steinfort for the 20th anniversary of the MCCL (Master Computer Club Luxembourg) . 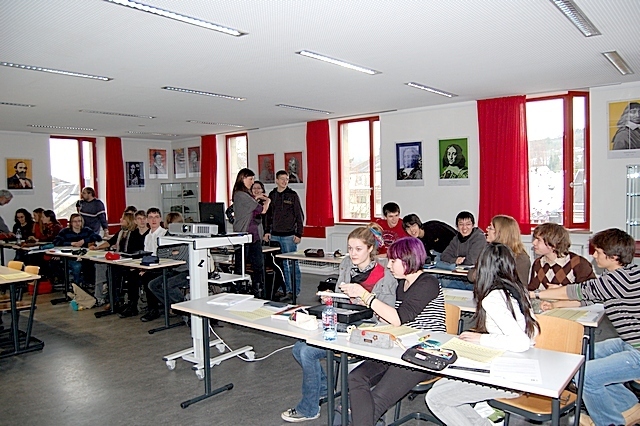 Atelier on mechanical calculators held at the LTEtt, a lycée in Ettelbruck, for their C-Days .